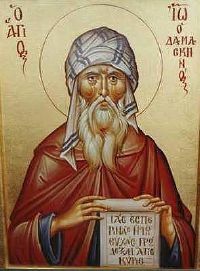 Saint John of Damascus (also known as John Damascene, and Chrysorrhoas, "the golden speaker") (c. 676 – December 5, 749) was a Syrian monk, priest and polymath whose fields of study included Law, Theology, Philosophy and Music. He wrote works expounding the Christian faith, and composed hymns which are still in everyday use in Eastern Christian monasteries throughout the world. His activities spanned from theology to politics for he was also the Chief Administrator to the ruler of Damascus. Today, he is renowned as a Doctor of the Church, often known as the Doctor of the Assumption due to his writings on the Assumption of Mary. In the Roman Catholic and Eastern Rite Churches, the title “Doctor of the Church” is awarded to only a handful of individuals who have made a profoundly positive impact on the development of Christian theology and practice. These figures were canonized saints whose contributions to the Christian faith were particularly formative to some way. Just as the Doctors of the Church were honored retroactively, the orthodoxy of their positions was demonstrated with the passage of time. Practically all the information concerning the life of John of Damascus available come to us through the records of John, Patriarch of Jerusalem. Dating back to the tenth century, his notes have served as the single source of biographical information and they have been lacking in many historical details as well as reflect a bloated writing style. As his name suggests, John was brought up in Damascus in an Arab Christian family living under Muslim rule. His father held a high hereditary public office with duties of chief financial officer for the caliph Abd al-Malik, apparently as head of the tax department for Syria. When John reached the age of 23, his father sought out to find a Christian tutor who could provide the best education for his children. Records show that while spending some time in the marketplace, John's father encountered several captives, imprisoned as a result of a raid for prisoners of war that had taken place in the coasts of Italy. One of these, a Sicilian monk by the name of Cosmas, turned out to be an erudite of great knowledge and wisdom. John's father arranged for the release of this man and appointed him tutor to his son. Under the instruction of Cosmas, John made great advances in music, astronomy and theology. According to his biographer, he soon equaled Diophantus in algebra and Euclid in geometry. In spite of his Christian background, his family held an important hereditary public office in the court of the Muslim rulers of Damascus, the Umayyads. John of Damascus succeeded his father in his position upon his death: he was appointed protosymbullus, or Chief Councilor of Damascus. It was during his term in office that iconoclasm, a movement seeking to prohibit the veneration of the icons, first appeared and gained acceptance in the Byzantine court. In 726 C.E., in disregard of the protests of St. Germanus, Patriarch of Constantinople, Emperor Leo III issued his first edict against the veneration of images and their exhibition in public places. A talented writer in the secure surroundings of the caliph's court, John of Damascus initiated his defense against the emperor in three "Apologetic Treatises against those Decrying the Holy Images", the earliest of his works, which gained him a reputation. Not only did he attack the emperor, but the use of a simpler literary style brought the controversy to the common people, inciting revolt among those of Christian faith. His writings later played an important role during the Second Council of Nicaea which met to settle the icon dispute. Unable to punish the writer openly, Leo III managed to acquire a manuscript written and signed by John of Damascus, which he used to forge a letter from John to the Isaurian emperor offering to betray into his hands the city of Damascus. Despite John's earnest advocation to his innocence, the caliph dismissed his plea, discharged him from his post, and ordered his right hand, which he used for writing, to be cut off by the wrist. According to the tenth-century biography, his hand was miraculously restored after fervent prayer before an icon of the Virgin Mary. At this point the caliph is said to have been convinced of his innocence and inclined to reinstate him in his former office. However, John then retired to the monastery of Saint Sabas near Jerusalem, where he continued to produce a series of commentaries, hymns and apologetic writings, including the "Octoechos" (the Church's service book of eight tones) and An Exact Exposition of the Orthodox Faith, a summary of the dogmatic writings of the Early Church Fathers. John died in 749 C.E. as a revered Father of the Church, and is recognized as a saint. He is sometimes called the last of the Church Fathers by the Roman Catholic Church. In 1883, he was declared a Doctor of the Church by the Holy See. In the Traditional Catholic Calendar, his feast day was March 27. However, the calendar revision of 1969 moved this far closer to the day of his death (December 5), to December 4. This had the added intention of removing a saint day from Lent, another aim of the calendar reforms. "An Exact Exposition of the Orthodox Faith" (Ekdosis akribes tes orthodoxou pisteos) – This third section of the book is known to be the most important work of John de Damascene, and a treasured antiquity of Christianity. Barlaam and Josaphat: This hagiographic novel was traditionally attributed to John, but is in fact a work of the tenth century. ↑ Christopher Rengers, The 33 Doctors Of The Church (Tan Books and Publishers, 2000, ISBN 0895554402). ↑ Mary H. Allies (trans. ), "St. John Damascene on Holy Images, Followed by Three Sermons on the Assumption" (London, 1899). ↑ R. Volk (ed. ), Historiae animae utilis de Barlaam et Ioasaph (Berlin, 2006). History of "John of Damascus"
This page was last modified on 24 May 2018, at 15:07.